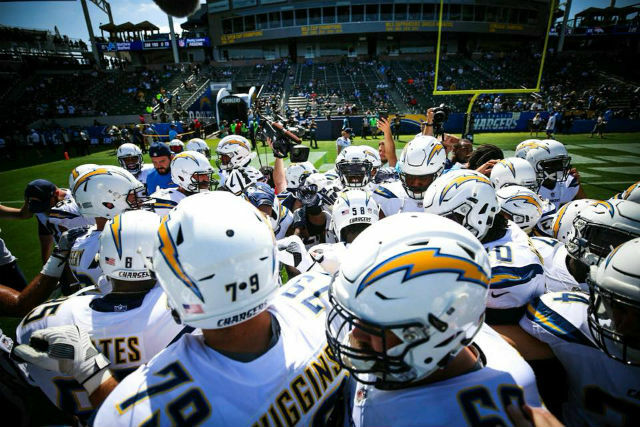 The Los Angeles Chargers stood and locked arms during the singing of the national anthem before Sunday’s game against the Philadelphia Eagles at StubHub Center, following the play that had been called by many NFL teams. Across the field, so did the Eagles. Coach Anthony Lynn said the pregame plan was to “show unity and that we’re a team.” He made that plan public Friday, in his final meeting with reporters before the game. There was no booing or other discord amongst the near-capacity crowd in the 27,000-seat Stub Hub Center, the soccer arena that is the Chargers’ temporary home field. Last Sunday, most of the Charger players and coaches stood and linked arms during the anthem before that game, although a few kneeled and some stayed on the bench.